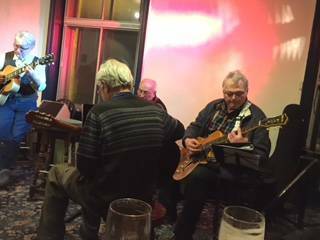 After a brief introduction by Ian on forthcoming events the evening got off to a bluesy start with Tom Prior, the usual opening act at HJGS meetings who began with a Glory of Love by Big Bill Broonzy. After a brief discussion of its origins, Google discovered the piece was written by Billy Hill. Tom of course adapted it into his own unique style and the piece fitted the evening well. Phil joined Tom on the double bass for a duo version of Lady Be Good, not quite the version I remember but exciting none the less and that’s what jazz should be, a meeting of ideas. Next up is Dave V G and Larry on guitars and Ben on bass. No Chris this week as he has flu but hopefully he is on the mend and will be with us at the next meeting. The trio began with a blues which had some consistently fine soloing from all members. This was followed by All The Things You, the Jerome Kern penned classic. This had a particularly fine solo from Larry who had a smashing tone from his new guitar. Charles, Darren and Colin were next to take centre stage. They began with A Lovely Way To Spend An Evening followed by I Love Paris, both arranged by Charles. After a short break it was time for the the bass trio, Swing Low. 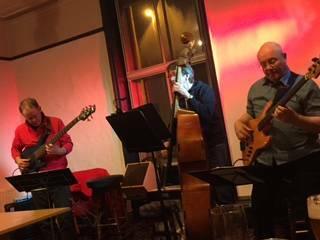 This is a delightful ensemble consisting of Paul Chamberlain, Phil Kampen and Ben Crosland all on bass. Their unique styles and Paul’s clever arrangements make this ensemble work really well. 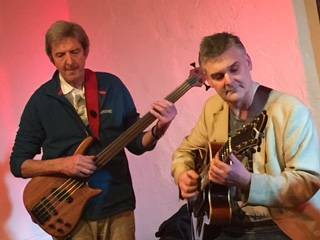 They began with Gentle Rain with Ben playing the melody on the fretless bass whilst Paul playing chords. Phil played first solo before Ben played a Jaco inspired solo before bring the tune back. They followed this with Air On A G String by Bach and Don’t Get Around Much with great playing from all members. Darren, Ian and Nick were next up with a version of Nature Boy. This began with Ian playing an unaccompanied version of the tune before Darren and Nick joined him. 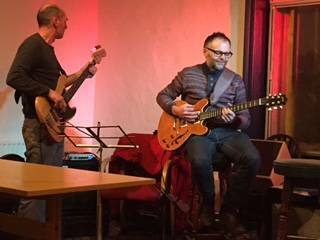 Ian was playing a beautiful new guitar, custom made for him by Daniel Slaman in The Hague. Daniel has made guitars for Pat Metheny amongst others and it did sound really good. We decided to do the Jam of the month tune at this point rather than at the end in case anyone had to go get a bus or train. This month it was appropriately My Funny Valentine. 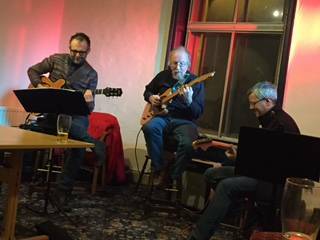 This began with Robert playing guitar and singing it accompanied by Colin, Dave, Ian and Paul. Solos were by Dave and Colin. 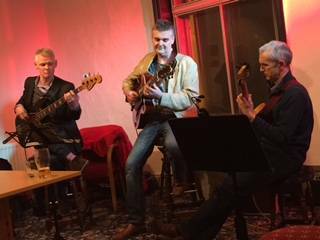 Adrian, Hayden and Jez were up with In a Sentimental Mood, followed by Mr PC with some great interplay between with the three guitars. Finally Dave Allen, Paul Compton and Darren finished with Work Song. The above review was one of many 4-star reviews for their 2015 release, ‘Chasing Tales’. (MGPCD016). Following the album’s February release, the duo toured the UK extensively in 2015 (60+ dates), plus a further 25-date tour in the spring of 2016 – consistently garnering more-than-generous reviews from the national and specialist press! Oxley & Meier were invited by Jazzwise to be the first ever featured artists to have a covermount CD attached to the magazine (December/January edition)! 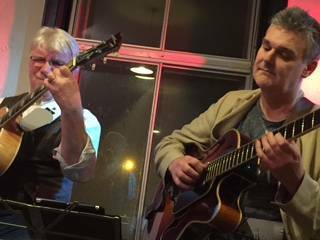 The duo will be releasing their new album ‘The Colours of Time’ in February 2017, to coincide with another major UK spring tour (35 dates). This is their most ambitious album to date, in that it is a ‘double: one disc in duo format, the second in quartet with bass and drums. Expect a dazzling display of contemporary fare, ranging from Turkish panache to soundscapes of latin America to English pastoralism. Hear this played on nylon string, steel string, electric, 12 string, fretless, slide, guitar-synth, glissentar guitars and more! The idea for this article came about through watching two guitarists play a short while ago. This really isn’t a criticism of their playing as I enjoyed what they did but each noticeably had a clearly defined role, one player played chords, off the peg shapes strummed four to the bar whilst the other guitarist played a solo, after a while the players swapped roles. A really good friend of mine, an excellent musician, orchestral conductor and pianist often jokingly describes jazz as “you show off then he shows off and then sometimes you both show off together”. Whilst this is said in jest there are times when this does occasionally ring true and his words popped into my head as I watched these two players. While there is a validity to their style of playing, it can be more musically satisfying to listen to two players who are both actively contributing to the development of the composition. Listen to Joe Pass and Herb Ellis for example, they create lines and parts which weave together in a form of counterpoint and the rhythm parts are stripped back to much small chord shapes yet played in a way to create greater harmonic movement and texture. This article explores some ways to achieve this. In music an interval is the distance between two notes. In a C major scale for example the distance between C and D would be a 2nd, C to E a 3rd etc. Intervals within an octave are known as simple intervals, intervals that go beyond an octave are known as compound intervals. In harmony the third and the sixth Intervals have a rich sound whilst the 4th, 5th and 8va quite a bare sound and the 2nd and 7th sound a little discordant. Here is a C major scale harmonised in 3rds. Taking the third up an 8va we arrive at a 10th, still the same two notes but there is more distance between them. Here is the same scale but this time in 10ths. Many players use the interval of a 10th as a foundation to their playing style, it can create a rich musical sound whilst remaining fairly transparent making it easier to facilitate solo guitar playing. 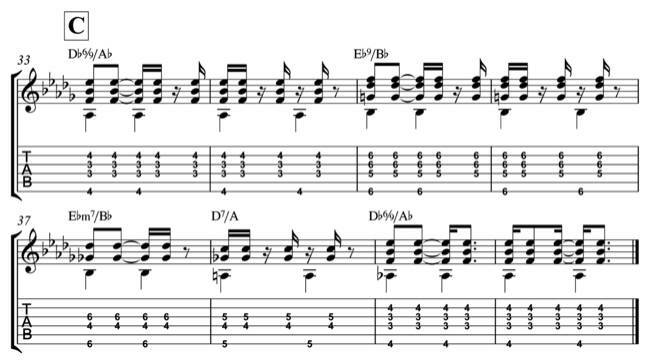 Here is an example of a familiar progression played just using 10ths. The harmonic intentions of the piece remain intact even though the chords have been stripped back to just two notes. The 10th is indicated with the bracket, the two chords at the end without the brackets are a 7th and an 8va. 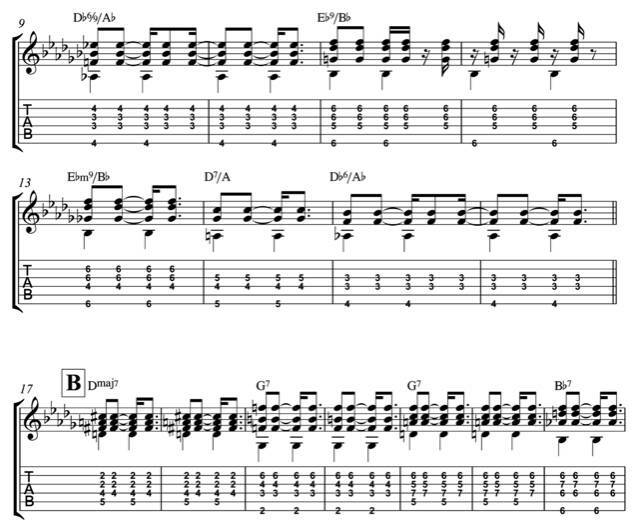 Here is the same progression used as a basis for a solo. 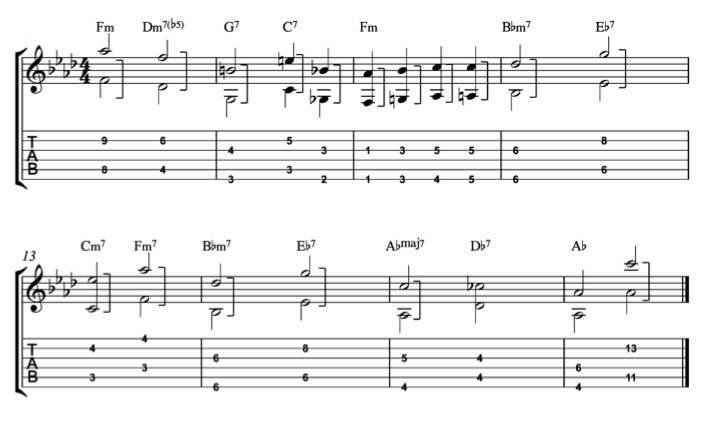 Using three note chord voicings. The 10th can be used as the foundation for constructing three note chord voicings; these are effective whilst comping as they can potentially create some interesting movement without getting in the way. Here is a fairly typical bass line figure. With a 10th added it looks like this. This in itself is a really interesting and effective device that can be used to good effect. 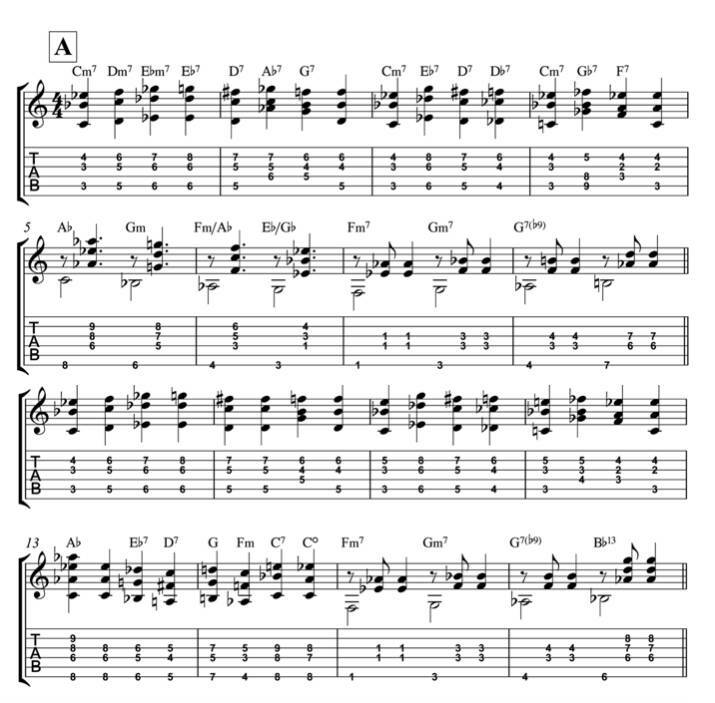 By adding another note to each of the intervals, usually one taken from the actual chord, in this case G7 and C7 it is possible to build a series of three note chord voicings. This approach in combination with a number of chord substitution devices is a great way for creating moving harmonised bass lines. Often the most effective chord substitutions are the addition of dominant chords (secondary dominants), tritone substitutions and m7 chords a perfect 5th above the original chord functioning as ii – V7 progressions. This is often called back cycling and can create strong harmonic movement. Adding G7 to the C7 bar creates a bit more movement. G7 is the dominant of C7. Approaching the F7 with its dominant and in turn including a m7 chord a perfect 5th above C7 creates a ii – V7 progression onto F7. Adding E7 will leading into Am7. Finally using tritone substitutions on some of the dominant chords creates a smoother more interesting chromatic line. A tritone substitution is playing a dominant chord a flat 5th above the root of the original chord. For example Db is a flattened 5th above G. In a progression it is possible to play Db7 instead of G7, it has a similar harmonic intention. As three note voicing this can be played like this. Look for similar examples in this blues. The above example is used in bars 3 and 4. 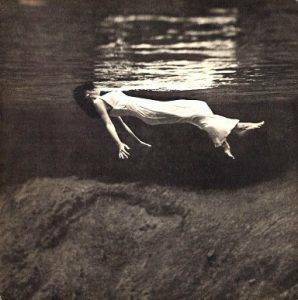 Undercurrent is a 1962 album by jazz pianist Bill Evans and jazz guitarist Jim Hall. This album is a true classic often featured in listings of some of the best jazz albums and is a master class in how to play in a guitar and piano duo. The opening track is an up tempo version of the Rogers and Hart classic ‘My Funny Valentine’. Whilst this tune features some clever and considered solo playing from Jim Hall one of the standout moments in the track is in Bill Evan’s solo when Jim begins to comp using three note chord voicing which really drives the tune along. 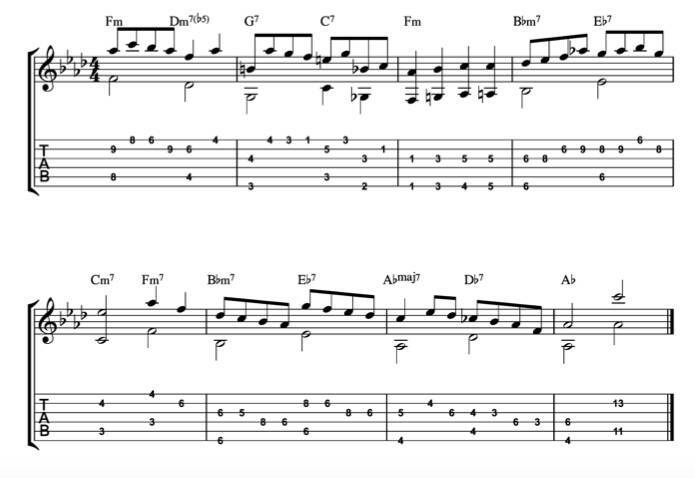 Here is a transcription of what Jim plays. The Girl From Ipanema (Garota de Ipanema) is a Brazilian bossa nova written in 1962 by Antônio Carlos Jobim with lyrics by Vinicius de Moraes. English lyrics were written later by Norman Gimbel. It was a worldwide hit in the mid-1960s and won a Grammy for Record of the Year in 1965. The first commercial recording was in 1962, by Pery Ribeiro but it was the 1964 single featuring Astrud Gilberto and Stan Getz which became the international hit. This had been shortened from the version on the album Getz/Gilberto which had also included the Portuguese lyrics sung by João Gilberto. Bossa Nova (New Beat) originated in Rio de Janeiro in the late 1950s and is probably the most well known form of Brazilian music. It has an original rhythmic accent which divides the phrasing of the samba and adds to it more complex, jazz influenced harmonies and an intimate and gentle singing style. Generally the bossa nova, like the samba is felt in two. Although in the real books bossa nova’s are generally presented either in 4/4 or cut common time I’m going to write the following examples in 2/4 as it represents a more authentic interpretation and it is also how it is written in Brazil. The Spanish (and also the Portuguese) word clave translates as key. The clave has its origins in Sub Saharan African music and is a rhythmic pattern found in Afro-Cuban, Jamaican mento and music from Brazil. The clave is a rhythmic figure which is the root of most of the rhythmic patterns and is usually played all the way through a song on a percussion instrument. The clave can also be played inverted but once the pattern begins it doesn’t revert. 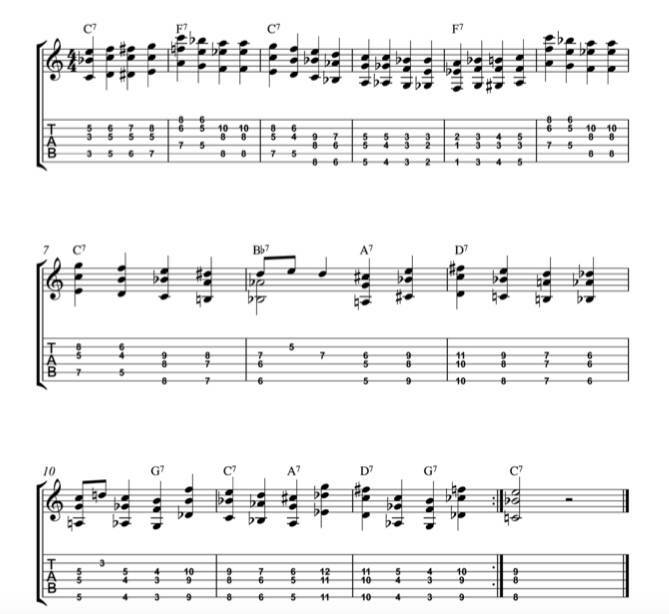 On the guitar the bossa nova is usually played finger style with the right hand patterns based on the clave figure. A variation to this basic pattern is with a semiquaver syncopation on the first beat. This coincidentally is a basic samba rhythm. Harmonically the chord progression for the A section follows a very straightforward pattern embellished with a few common chord substitutions, shown here in the more familiar key of F major. This is the sequence stripped back to its most basic form, just a series of tonic and dominant chords. Approaching the C7 chord with its dominant chord (G7) gives the progression a stronger harmonic direction and more interest. This is commonly referred to as a secondary dominant. An often used technique is approaching a dominant chord with a minor 7th with a root a perfect 5th above, this effectively creates a ii-V7 progression. The tritone substitution is frequently used in bossa nova and helps create that characteristic sound. 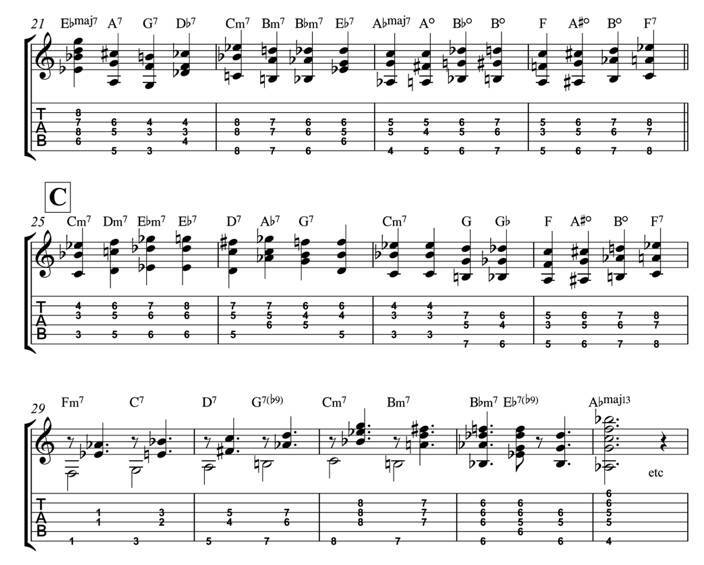 By replacing the C7 chord with another dominant whose root is a flat 5th above (Gb7) we arrive at the familiar progression used in The Girl From Ipanema. Soloing on The Girl From Ipanema chord sequence. 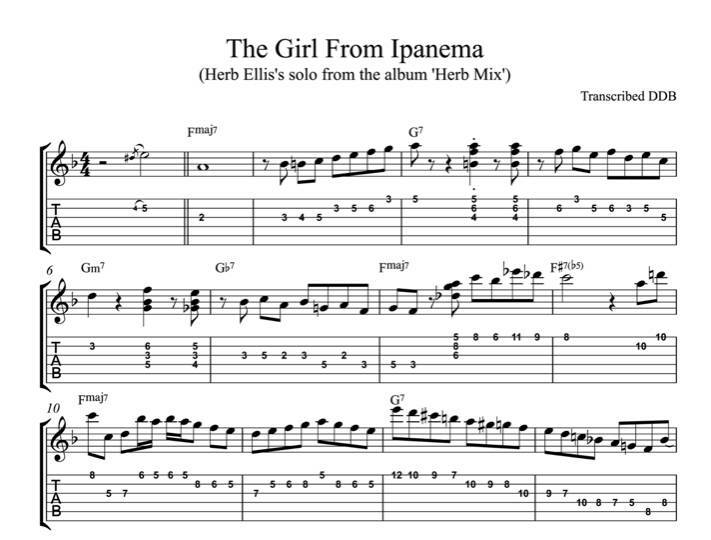 There are a great many options when soloing on The Girl From Ipanema, far too many to be explored in this short article. 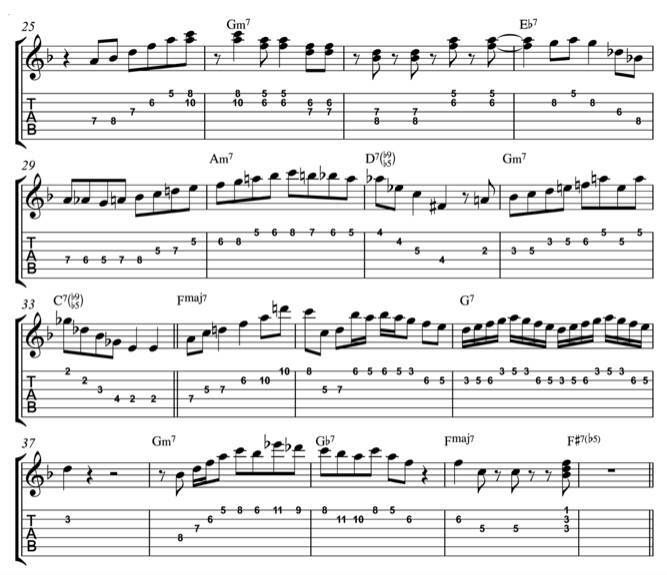 Instead I’ve included a solo played by Herb Ellis off the 1981 album ‘Herb Mix’. Herb doesn’t often record in a trio setting such as this, on the album he is joined by bassist Bob Maize and drummer Jimmie Smith so it is interesting to hear his approach. 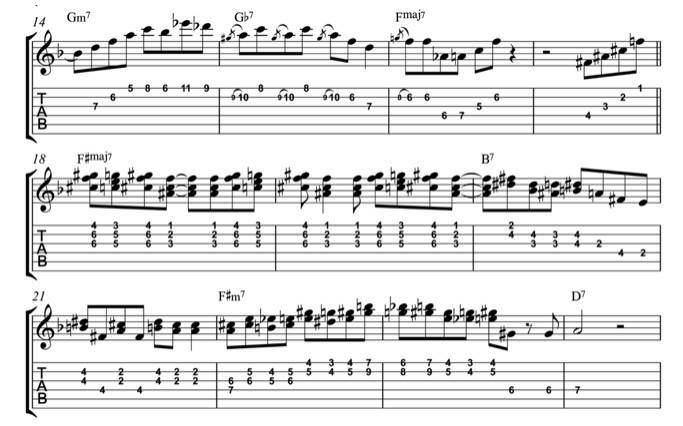 Learning and analysing solos by others is great way to bring fresh ideas into your own playing. In this solo Herb doesn’t do anything particularly groundbreaking, his solo is melodic and considered. The chordal elements in the B section are particularly nice. 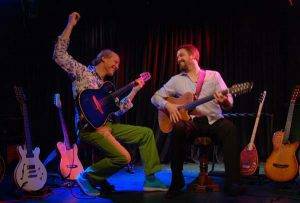 IMPROVE YOUR JAZZ GUITAR SKILLS AT THIS GREAT VALUE EVENT! 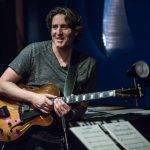 Whether you’re a gigging jazz guitarist or new to the art of playing jazz, provided you know your way around the guitar fingerboard this course is for you! Five 2 hour workshops with internationally renowned tutors. To enrol call +44 (0)1745 812260 or see www.northwalesjazz.org.uk and download the enrolment form. MASTERCLASS BY ADRIAN INGRAM FOR GROUP A ONLY. SATURDAY AFTERNOON 2 – 4pm. A choice of two levels of tuition. 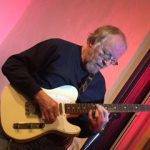 Topics covered include performance, accompaniment, chord melody and improvisation. Lunchtime jam sessions, backed by bass and drums (Concessionary rate applies to State Pensioners, Registered Disabled, UB40’s, Students’ Union Members and School Children) Special rate for NWJS members (fully paid up on date of booking) £115. £50 deposit, (non-refundable), on booking. ALL THE ABOVE FOR ONLY £120, Concessions £110. Wide choice of reasonably priced accommodation available in Wrexham and the surrounding area. 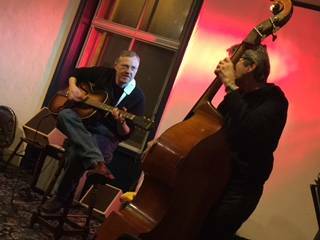 SINCERE THANKS TO THE SPONSORS OF OUR JAZZ GUITAR EVENTS, BARNES AND MULLINS LTD, FOULDS OF DERBY, FRAILERS AND BACK ALLEY MUSIC. Registered Charity No. 508519 President: Martin Taylor MBE.